Quality - Quercus Sp. z o.o. In our day-to-day practice, we make all efforts to ensure that our products meet highest quality standards. We guarantee the repeatability of physio-chemical parameters of raw materials delivered to our customers. We gain biomass exclusively from Polish State forests, which are managed with respect for the ecosystem’s preservation, sustainability, and conservation. It comes mostly from the areas of the Regional Directorates of State Forests in Białystok, Olsztyn, Szczecinek, and Gdańsk as well as from private forests. We cooperate daily with more than 40 forest district offices from those areas. While working on orders from private investors, we also make sure to act legally and protect ecosystems. FSC® is the most prestigious system of certifying forests and timber products, which is recognisable all over the world. The system is based on a number of rules of proper forest management and the method of verifying such methods in site. FSC® logo guarantees the responsible forestry. When placed on a product, it informs a buyer that the raw material comes from areas that are manged in line with standards of sound forest management. The condition for receiving a certificate is to run the forest activity in accordance with all legal regulations applicable in the country as well as international treaties and agreements that are signed by the country. Moreover, it is obligatory to fulfil strict rules and criteria of awarding the logo. 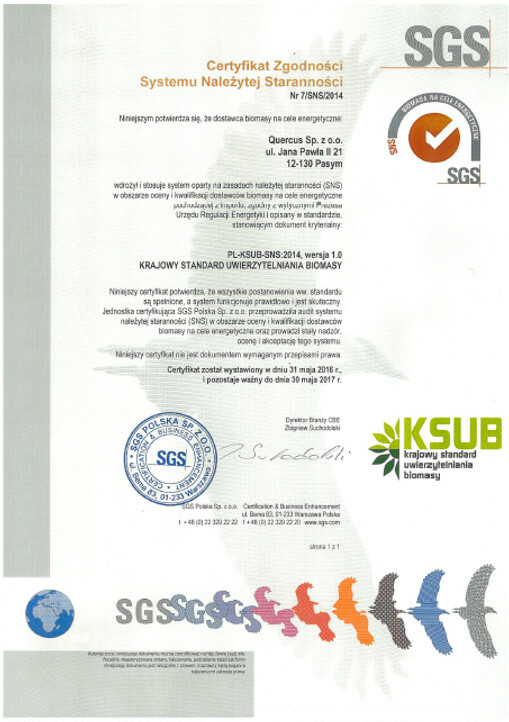 The certificate of due diligence is the Polish logo of conformity to highest standards and the quality of obtaining forest and farming biomass for power purposes. The SNS logo guarantees that biofuel comes from a sustainable and reliable source. The logo is given only to products that fulfil safety standards within environmental protection, while their supplier minimizes risks by providing transparency within the origin of resources in the whole supply chain. 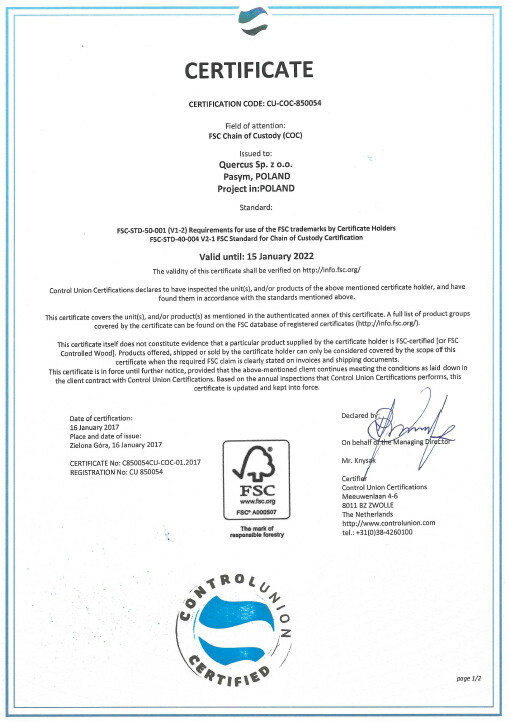 The condition for receiving a certificate is to offer products that are not contaminated chemically or physically and come exclusively from valuable timber.